The most successful, furthest travelled and famous ship in the world, ever! 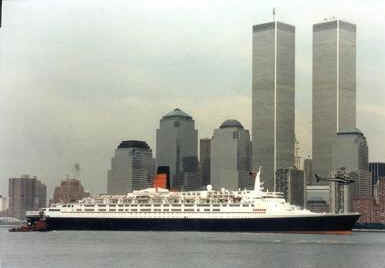 The last of the legendary Clyde built Cunard Queens. Queen Elizabeth 2 (or QE2 as she was almost always referred as) was launched in 1967 by the Queen at the famous John Brown's Shipyard in Clydebank, near Glasgow, Scotland and began her long, long service life in May 1969, travelling nearly 6 million miles (further than any other ship ever) before retiring to Dubai in November 2008. She was conceived to be a transatlantic ocean liner first and foremost (fast, strong, comfortable & safe in heavy seas), but they also designed her to capable of cruising successfully - with full air-conditioning, vast open decks, 4 swimming pools etc. She was the Flagship of the British merchant fleet and the only ship providing a regular scheduled 5-day transatlantic passenger service for over 30 years until the launch of the QM2 in 2004. She was the first ship in the world to be awarded 5 stars by the Royal Automobile Club, an honour normally reserved only for top-class hotels. For all of her 39.5 year service life, she exuded taste, class and luxury more than any other liner. She was understated and 'comfortable' in a truly British way. She was 'lovely' and many thousands of passengers travelled on her time after time. Her restaurants were equivalent to the very best hotels in the world. 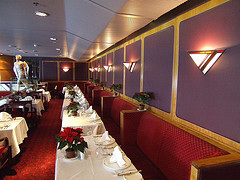 Glorious food was served throughout the day and night whilst on board. 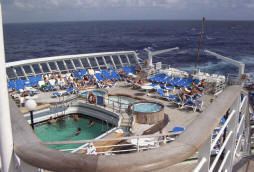 Her 1,800 passengers had over 1,000 staff at their beck and call. and re-furnished, still felt like the room did in 1968, and all the better for it. Feeling completely different by day and by night. 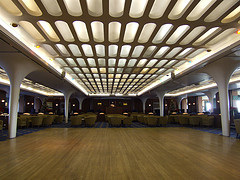 When she was new she had fantastic modern space-age 1960s interior decor and a revolutionary sleek modern white funnel. Over the years she became increasingly more "retro" and in the late 1990s this came to a pinnacle with the "Titanic" style that the public think they wanted. 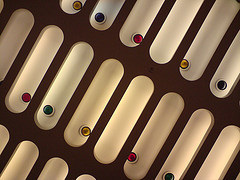 Elements of the original design remained until 2008, however, if you knew where to look and the overall effect was rather good. 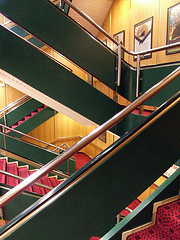 aluminium handrails and the bannisters, although they'd been re-painted. Speed - Right up until her last day in service in November 2008, QE2 was the fastest merchant ship in operation capable of speeds of up to 34 knots ; her service speed of 28.5 knots, was far beyond most cruise ships maximum speed and her average speed, including time spent stationary in port was over 24 knots. She could effortlessly exceed 30 knots, even on her final voyage to Dubai. She could make the Atlantic crossing in less than 4 days. (By comparison, the 2007 Queen Victoria's maximum speed is in the very low 20s and she needs 8 or even 9 days to do the crossing). She could sail backwards (19 knots) faster than many cruise ships can sail forwards. Power - NINE diesel engines, each larger than a London double-decker bus, connected 130,000 hp to the largest marine electric motors ever built and gave her the most powerful propulsion plant on a non-military vessel. She was the most powerful and fastest twin propeller ship in the world. QE2 on the Clyde on the 20th of September, 2007, 40 years to the day since her launch there. QE2 was Home for her birthday, and there was a HUGE turnout especially since everybody now knew she only had 1 year left at sea... these photos and video is of her heading into the night, to continue her round-Britain celebration birthday voyage. Well Travelled - She completed 26 circumnavigations of the world and travelled 5,875,264 nautical miles!! That's further than any other ship ever has, or ever will do again. Its equivalent to 270 times around the equator or 14 return trips to the moon. She carried more than 3,000,000 passengers. She completed 1,374 voyages with an average speed of 24.75 knots. She crossed the stormy Atlantic Ocean an amazing 806 times. Boat deck's promenade - a site that would be familiar to travellers in 1910. 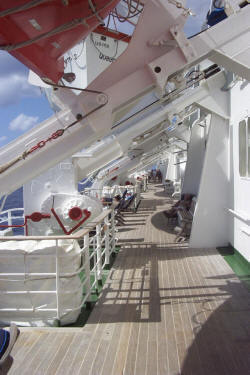 More outdoor deck space than any other ship, all teak, much of it sheltered. 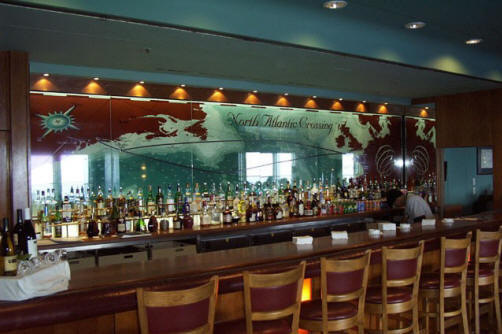 The wonderful Yacht Club for dancing the night (& morning!) away or a quiet afternoon coffee or glass of wine. The best EVER photos of QE2 - tackling sea swells on the Atlantic - taken from Queen Victoria Alongside. 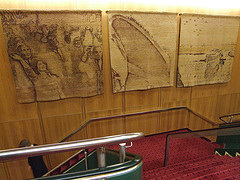 Details and photos of my trips aboard on December 14th-16th 2007 and August 12th - 22nd 2008. A panoramic view from the bridge. A passenger's account of a very stormy Atlantic crossing in December 1998. Hear the QE2's "whistle" sound! For hundreds more pages, see the menu at the top, and all the levels beneath it,. Her bow cutting through the Atlantic at 35 mph. The QE2 Story Discussion Forum - QE2 lovers the world over share their memories. Its the perfect place to ask a question and get an answer! Richard Coltman's AMAZING QE2 Website. I can't recommend this highly enough. The virtual tour is unmissable. "When I Ruled The World" - a superb 1 minute video montage from the BBC showing the QE2's life & times. 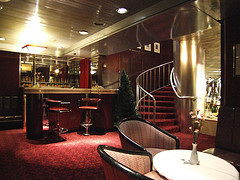 RMS Queen Elizabeth 2 - A wonderful site dedicated to QE2 with many unique elements not found on other sites. Lisbon-based Luis Miguel Correia's QE2 site. 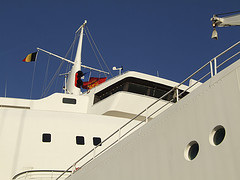 Lisbon was one of QE2's most frequent ports of calls from before the maiden voyage, until the final voyage. QE2 handed to her new owners. Cunard CEO and QE2's Captain in tears. Glasgow University QE2 Archive - absolutely STUNNING original photos, unseen before. They really capture the essence of what the ship was originally like. 1969 Design Magazine with an extensive detailed feature on QE2 as originally built. Sam Warwick's QE2 Home Page Sam's father and grandfather have been masters of the QE2 and his QE2 Pages are well worth a visit . His father, Ronald Warwick, is the first master of the QM2 and Commodore of Cunard Line. EPIC Video of QE2 riding the Atlantic beautifully, just the way she was built. Thanks to Andreas Busecke for this!! 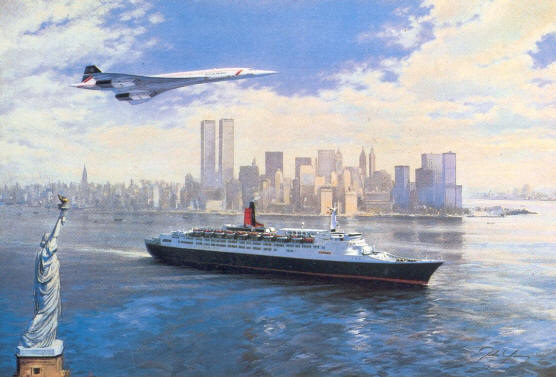 World Ship Society, New York - details of QE2's final months, her final voyage to Dubai, the last transatlantic crossing, and a lament from famed maritime historian John Maxtone Graham. Chris Frame's Book which captures her as she was in her final year at sea. Carol Thatcher talks to BBC's Woman's Hour abour her new book 'Forty Years Famous' about the QE2. An interview with Captain John Scott, former chief officer of the QE2. Captain of the Noordam (identical to the Queen Victoria) he compares the two - he talks about her immense power, and whether she could have remained in service. Fascinating Full-length 1982 BBC Programme about QE2's conversion for war duty during the Falklands Conflict. My friend Chris Frame's Cunard Pages Highly recommended! 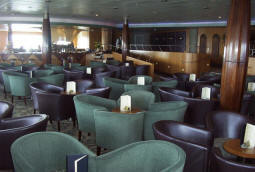 This fascinating web page, describes the style of the QE2 when she was launched - what was known as "space age style". Much derided now, she was much admired and very advanced in her early days! Michael Reilly's website Interesting QE2 section from a young American guy who worked in the QE2's printing section during spring/summer 1998. Cunard White Star Line The QE2's owners, until Nov 27th 2008 at least, and the oldest shipping line of them all. 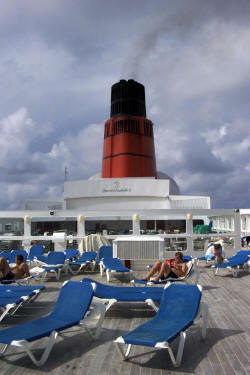 QE2 was the longest serving ship in Cunard's 168 year history. 2 Icons of man's achievements in the 20th century. 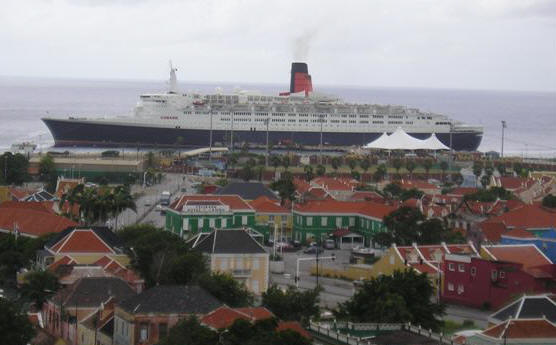 Above photo, of the QE2 in Curacao copyright © 2005 Desmond Rafferty.